It has been nearly three weeks now since Hassan graced our lives and changed our family dynamics forever. We have been busy getting to know one another and I haven't spent as much time in the kitchen as I would have liked to. Instead, I have been busy eating whoesome meals prepared by my Mom and Mother in law. To celebrate the occassion, we ate together with close family and shared a simple meal. My Mom prepared a fragrant cumin scented pilaf with a spiced version of this mung soup. And for dessert- we had a cardamom infused carrot pudding. Lots of butter, lots of pistachios and lots of love. A complete meal with loved ones. It felt good to be back in the kitchen and even better to be sharing it with my Mom. The best part was getting back to photographing. Doing what I love and enjoy the most- creating and eating good food and photographing it. Today though, I want to share with you a simple pasta dish I created a few weeks ago for the third issue of House of Fifty. I've been making this version of spaghetti for about two years now, since Maryam started eating pasta actually. It has evolved as Maryam's palate has become more sophisticated. What started off as mere spaghetti tossed in olive oil has now seen the addition herbs, roasted tomatoes and garlic croutons. When Maryam is going through her picky phases, this is one meal I know she'll relish. Who knows what it will transform into as she gets older. Head over to House of Fifty for more images as well as a recipe for focaccia. Also, I would like to thank all of you for the lovely comments and messages you left on my last post. Me and Akber really enjoyed reading through each and every single one of them. Thank you! Preheat the oven to 180 degrees Centigrade. Place tomatoes in a baking tray. In a separate bowl, mix together the olive oil, chili flakes, pepper, thyme and salt. Drizzle over tomatoes and bake for 15 minutes. To make the croutons, mix together olive oil, pressed garlic, parsley and salt. Spread this paste over each slice of the baguette. Bake the baguettes in the oven until crispy. Let it cool slightly before chopping into 1cm croutons. 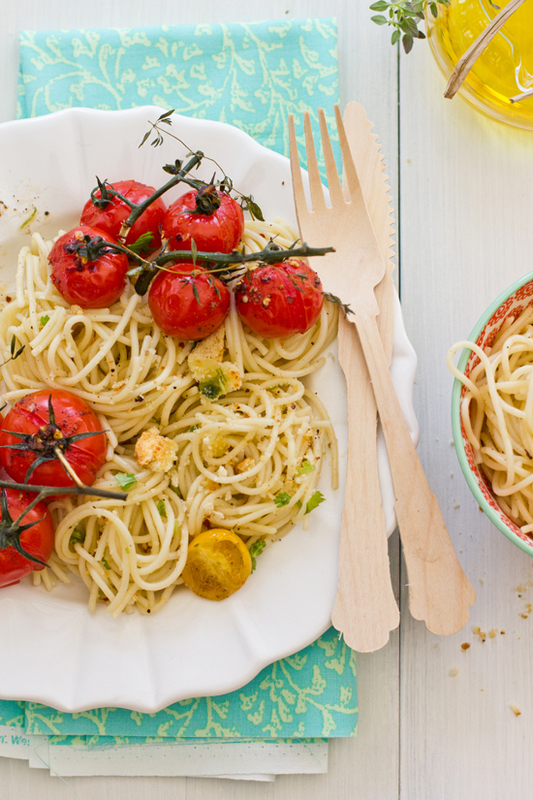 Toss the cooked spaghetti in olive oil, chili flakes and season with salt. Sprinkle with croutons and extra parsley. 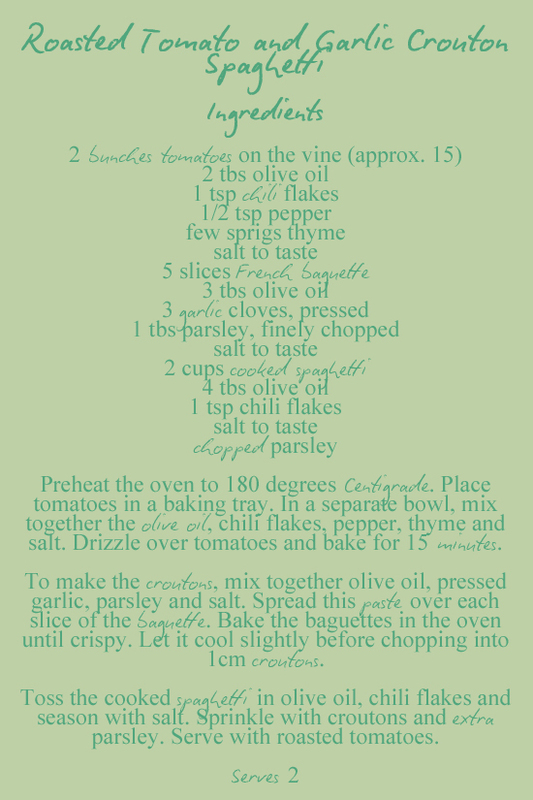 Serve with roasted tomatoes. Love how the tomotoes look! I know my son would love this too...he loves pasta dishes with fresh herbs! Your little boy is too sweet and all that hair - I don't know how I missed the last post with the photos! I love simple pasta dishes like this that highlight the best qualities of each ingredient. So glad you were able finally able to cook and take pictures!Have a great week, Sukaina. I'm so glad to hear that everything is going well with your sweet little boy! This meal is absolutely beautiful and the perfect thing to nourish your growing family. I'm always curious to find out about the customs of different cultures. What is the history/significance of shaving the baby's hair on the seventh day? A scrumptious spaghetti dish! What gorgeous flavors. There's nothing more beautiful than a simple pasta dish. You've made me want to jump through the screen! Thank you. You have sensational photography - this dish is delicious enough but you make it seem like nothing else will stop my craving taste buds! I loooooooove this! And you photos are incredible. Are you a professional photographer??? If only I could take pictures like you do, everything looks amazing! Awe!! So glad that you're spending time with your little one!! This dish looks so great! Gorgeous photos, as always:) Mabrook to you and your family! Very lovely photos, they capture both the simplicity and elegance of this meal. It looks wonderful. Beautiful recipe and lovely pictures. This sounds amazing! 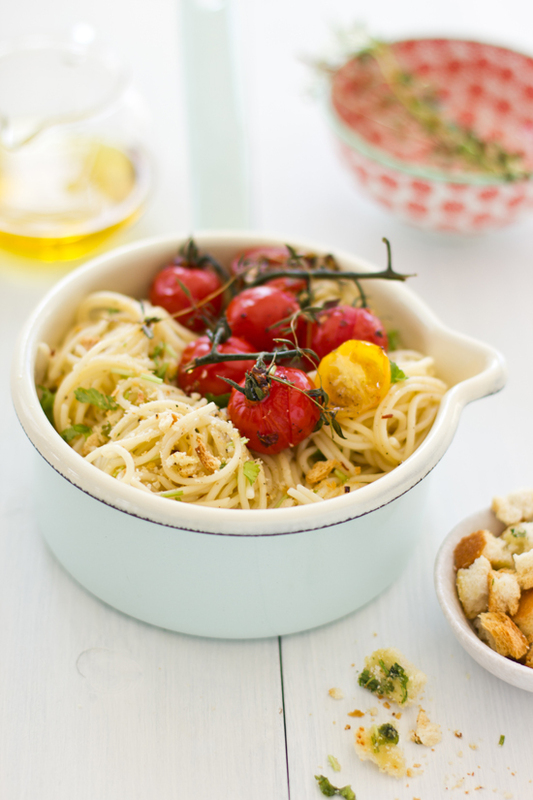 I love a simple spaghetti dish and those roasted tomatoes look amazing! 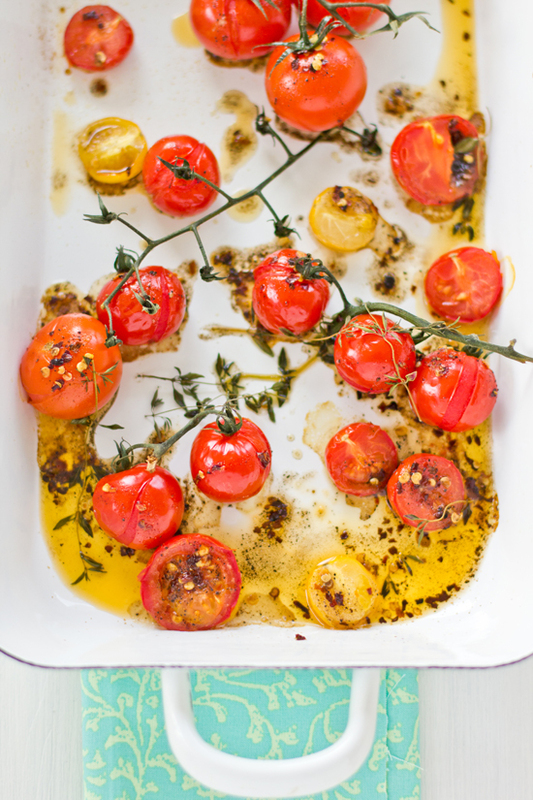 Roasted tomatoes would have to be one of my all time favourite things. I'm glad to hear everything is going well with your new bundle of joy. He's just adorable! Wow Sukaina!! Absolutely gorgeous clicks!! Loved the spaghetti!! im glad your back to the kitchen sukaina....missed your food.. this spaghetti looks so easy to whip up...cant wait to make it! Congratulations again on your beautiful little boy! This recipe looks lovely and do rest assured - by the time your little girl is older I'm sure she'll be eating even more adventurous things. When I was young pasta with parmesan and a little olive oil was one of the only things I'd eat and now I love pretty much anything! This plate of spaghetti looks so appetizing I am feeling hungry now..
Those roasted tomatoes look beautiful resting on the mounds of pasta. 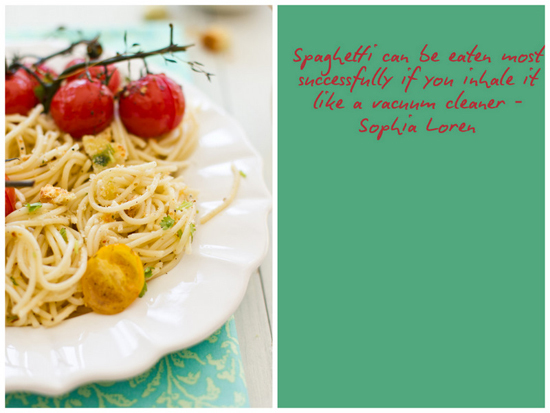 And I love that quote by Sophia Loren! 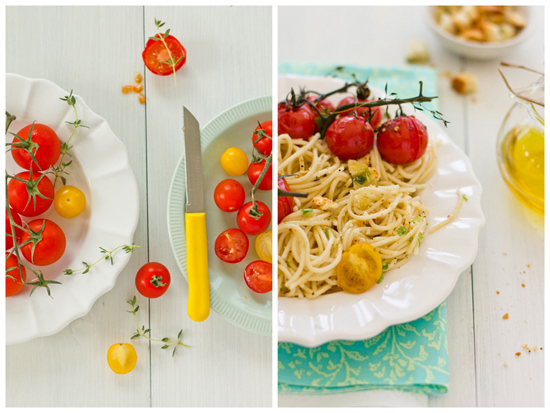 Lovely clicks..especially that one with a yellow knife to match with those tomatoes! And congratulations for the new addition to your family. Hugs. 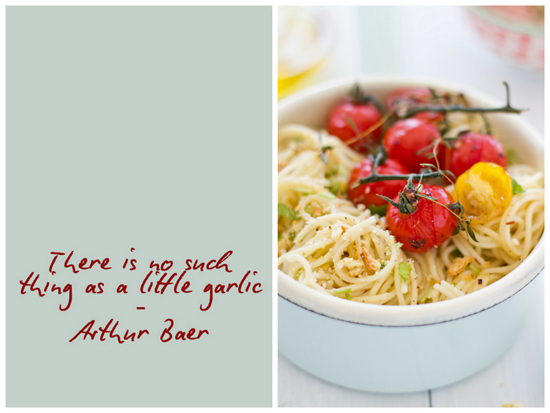 Those quotes, and this scrumptious recipe, just put a smile on my face. Thank you for this wonderful start to the morning. this is a feast for the eyes, it warms me up in this cold day! More than this spaghetti, it is awesome to see you back, doing what you do so well! Kudos to you Sukaina..
Super tempting pasta, makes me hungry..well done ! That's a really great presentation...love keeping the tomatoes on the vine. I love pasta, and your photos are so amazing! Congartulations on your little boy! I love garlic in pasta dishes. They really are a perfect match. Lovely pictures...Keep posting! Love your food. The pictures are fresh. Will try this recipe. I find food the simpler the better. I've just discovered your site and I am in love with your style and photography. This looks delicious. Little bit of garlic, and this is everything what you will ever wanted for lunch! Amazing! All his beautiful hair gone??? :( we have the similar ceremony too, but when the children are a little bit older. Its almost been a month right? How time flies.Bless your beautiful family. 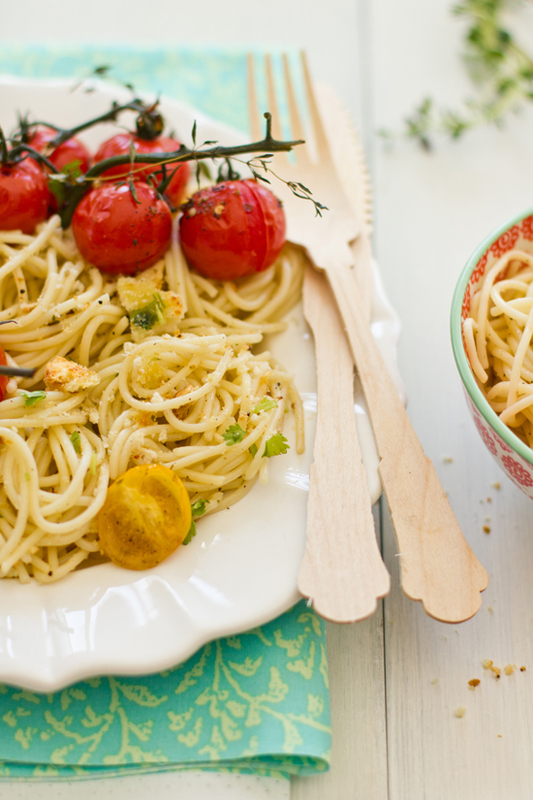 lovely refreshing pasta, simple vibrant and loaded with flavors. And I cannot say enough of your photographs Sukaina. this is a beauty. I can always live with a bucket of garlic. not to mention this delicious plate of spaghetti.